Here is an article and supplementary material on buzz-pollination in Australian native bees, from a study I made in Capertee Valley, New South Wales, in October-November 2016. 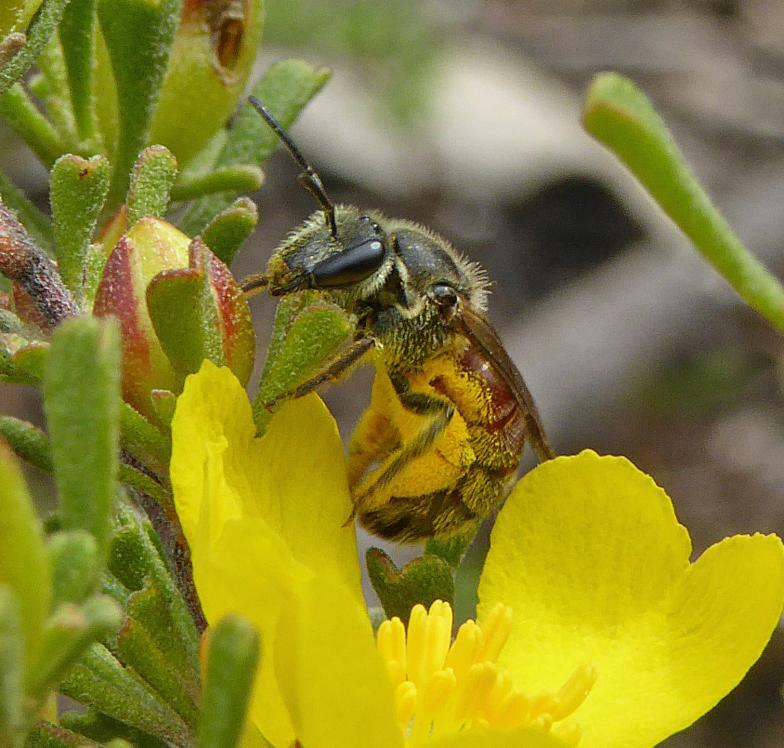 Buzz-pollination of Hibbertia obtusifolia by Australian native bees – a comparative study of bee buzzing behaviour in Capertee Valley, New South Wales. Summary: Same-sized Hibbertia obtusifolia flowers were being buzz-pollinated by different-sized native bees, creating an opportunity for a direct comparison of bee buzz pitch. Popular science suggests bees may conform to a single pitch (middle C) to obtain pollen from some flowers. My study shows that buzzes spanning a full octave either side of middle C caused pollen to be released. Other aspects of bee buzzing behaviour are discussed. 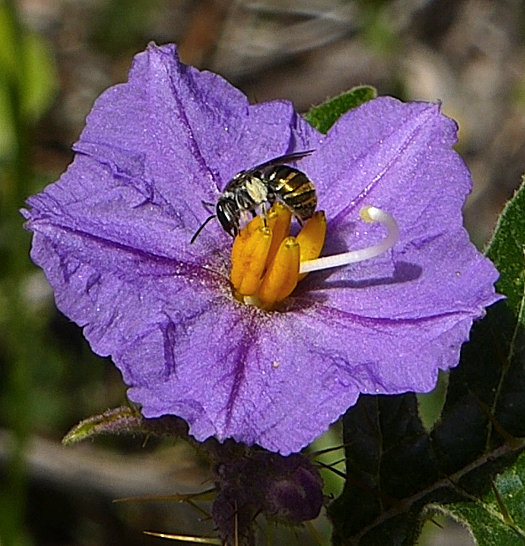 Lipotriches flavoviridis bee buzz-pollinating a native Solanum flower. AUDIO: 8 pollination buzzes are followed by a flight buzz. VIDEO: See a 22-second video (2.6 mb) of Lipotriches flavoviridis buzz-pollinating a Solanum flower, here. DATES: video & stills 672, 08-Nov-2016, 10.11 am EST, Lumix DMC-TZ60; audio 4504, 08-Nov-2016, 10.41 am EST, ME66 gun mic to Olympus LS10. NOTES: This metallic striped bee is 8 mm in length. Its pollination buzz pitch averaged 255 Hertz and was easily audible in the field. Reed bee Exoneura species buzz-pollinating Hibbertia obtusifolia flower. DATES: image 670, 29-Oct-2016; video 669, 29-Oct-2016, 10.43 am EST, Lumix DMC-TZ60; audio 4505, 10-Nov-2016, 8.25 AM EST, built-in mics of Olympus LS10. NOTES: This tiny red and black bee is 5 mm in length and has a characteristic wedge-shaped tip to its abdomen. Its pollination buzz pitch averaged 284 Hertz. The faint buzzes cannot be heard in the movie and were not audible in the field. White-striped Lasioglossum bee taking flight from a Hibbertia flower. AUDIO: 10 pollination buzzes are followed by 3 flight buzzes. 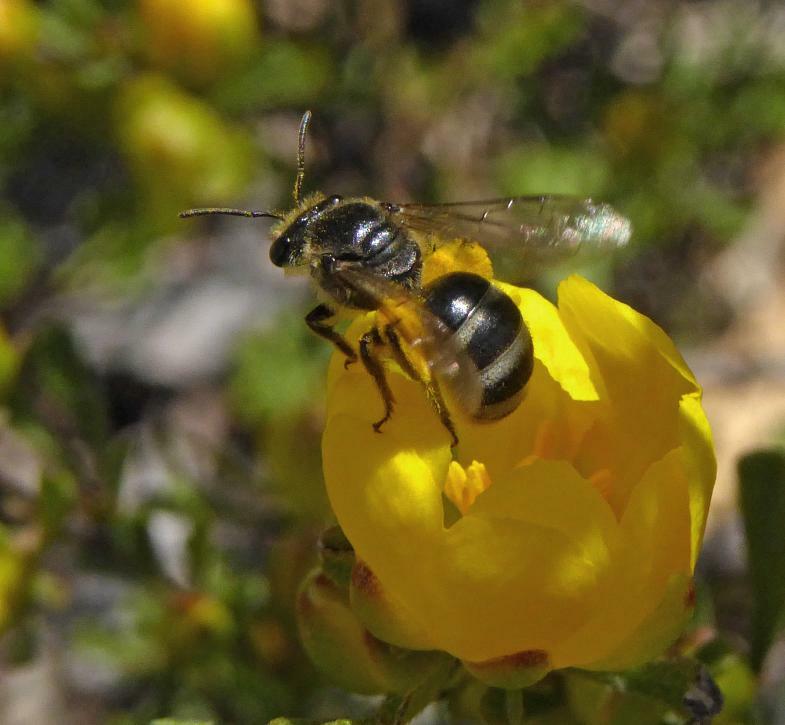 VIDEO: see a 23-second video (4 mb) of white-striped Lasioglossum bee buzz-pollinating a Hibbertia flower. DATES: image 131, 25-Oct-2016; video 541, 27-Oct-2016, 7.41 am EST, Lumix DMC-TZ60; audio 4465, 7-Nov-2016, 7.09 am EST, ME66 gun mic to Olympus LS10. NOTES: This medium-sized black bee has grey-white bands on its abdomen and is 10 mm in length. Its pollination buzz pitch averaged 216 Hertz and was clearly audible in the field. In the movie note the vibrating antennae each time the bee buzzes, before taking flight at the end. Carpenter Bee Xylocopa aeratus landing on a Hibbertia flower. AUDIO: alternating flight and pollination buzzes; the pollination buzz is higher pitched. VIDEO: see a 24-second video (5.2 mb) of the carpenter bee Xylocopa aeratus flying and buzzing Hibbertia flowers. DATES: image 580, 08-Nov-2016, 6.32 am EST; video 764, 30-Oct-2016, 7.43 am EST, Lumix DMC-TZ60; audio 4411, 30-Oct-2016, 7.19am EST, ME66 gun mic to Olympus LS10. 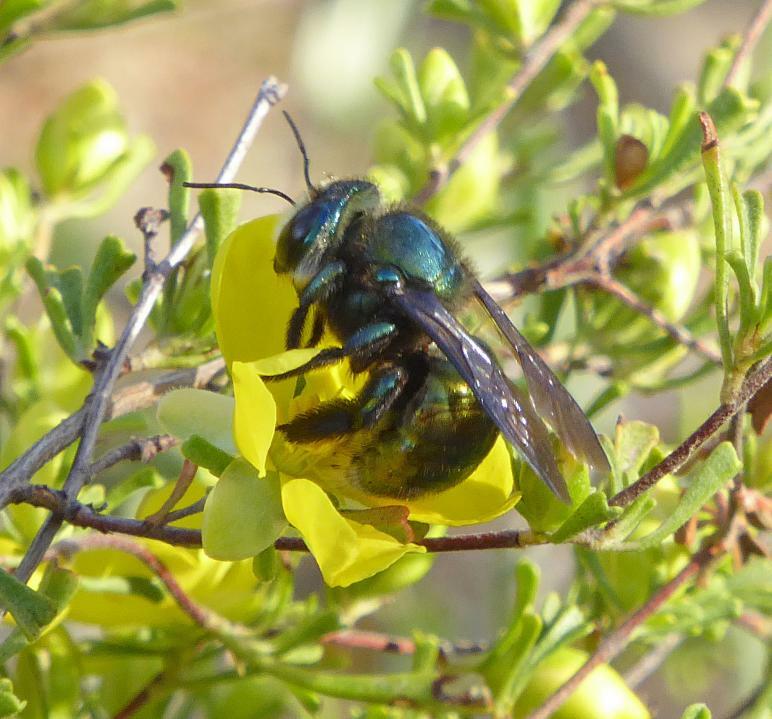 NOTES: This very large bee (a female) is a metallic blue-black with a golden sheen to her abdomen, and is 18 mm in length. Its pollination buzz averaged 310 Hertz and could be heard from many metres away. Each flower is buzzed just once. The male carpenter bee (final image on this page) is a golden colour and did not take pollen from the Hibbertia flowers. Emerald Homalictus Homalictus urbanus bee about to take flight from a Hibbertia shrub. AUDIO: 12 pollination buzzes followed by two flight buzzes. VIDEO: see a 36-second video (3.5 mb) of the Emerald Homalictus buzzing the anthers of a Hibbertia flower. DATES: image 006, 16-Nov-2016; video 946, 16-Nov-2016, 8.27 am EST, Lumix DMC-TZ60; audio 4556, 16-Nov-2016, 9.15 am EST & 4560, 18-Nov-2016, 7.56 am EST, built-in mics of LS10. 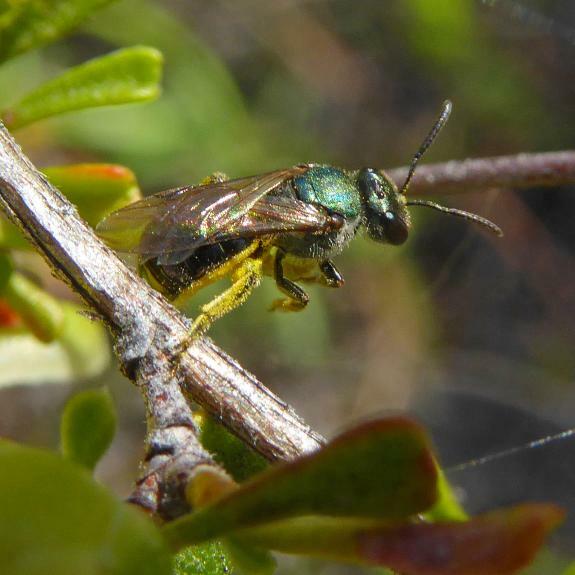 NOTES: This tiny bee has a metallic emerald sheen to its thorax and is 5 mm in length. You can see the yellow pollen on its underside in the photo. Its faint buzzes are inaudible in the field but averaged 207 Hertz from the recordings. You cannot hear the buzzes in the video but you can see several buzzes when the wings and antennae become blurred. The audio clip of 35 seconds was edited (gaps shortened) from a sequence of 1 minute 43 seconds. 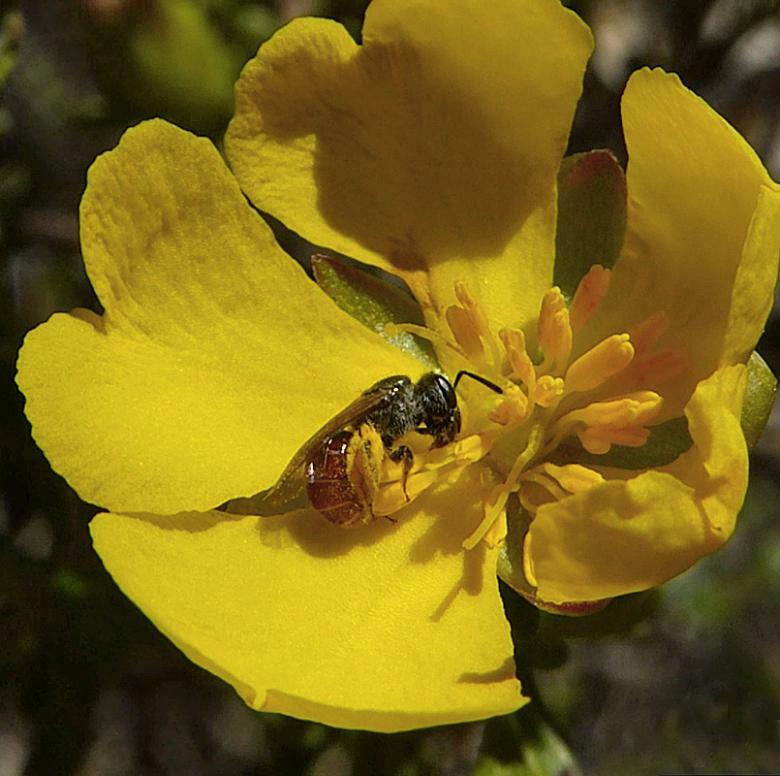 Lasioglossum (Parasphecodes) hiltacum bee is collecting pollen on a Hibbertia flower. AUDIO: 10 pollination buzzes, a flight buzz, then a soft high-pitched ‘warm up’ buzz before flight. VIDEO: see a 60-second video (7 mb) of Lasioglossum hiltacum buzzing, grooming, flying, and walking to the next flower. DATES: image 839, 30-Oct-2016, 8.09 am EST; video 819, 30-Oct-2016, 8.03 am EST, Lumix DMC-TZ60; audio 4499, 08-Nov-2016, 7.26 am EST, ME66 gun mic to LS10. NOTES: This medium-large bee (12 mm in length) has a dark red abdomen with a black tip. Note the pollen on its hind legs and belly. The pollination buzz averaged 217 Hertz and is quite loud. You can hear it clearly in the video clip. Tiny red-grey Lasioglossum species bee in a Hibbertia flower. AUDIO: 13 pollination buzzes with 3 edits; no flight buzzes were recorded. The buzzes are faint and ambience intrudes. DATES: image 112, 2-Nov-2016; video 876, 30-Oct-2016, 8.12 am EST, Lumix DMC-TZ60; audio 4417, 30-Oct-2016, 8.15 am EST, Olympus LS10 with ME66 gun mic no windshield held 1 cm from top of bee, volume increased 25 db in post. NOTES: A tiny red and fuzzy-grey bee (5 mm in length), it does not have a wedge-shaped tail. Its pollination buzz averaged 202 Hertz but was inaudible in the field. In the video you can see the buzzes but not hear them, and the bee walks to the next flower. European honey bee Apis mellifera. AUDIO: Flight buzzes only, a series of 6 buzzes from a bee taking nectar in a Leucopogon shrub. 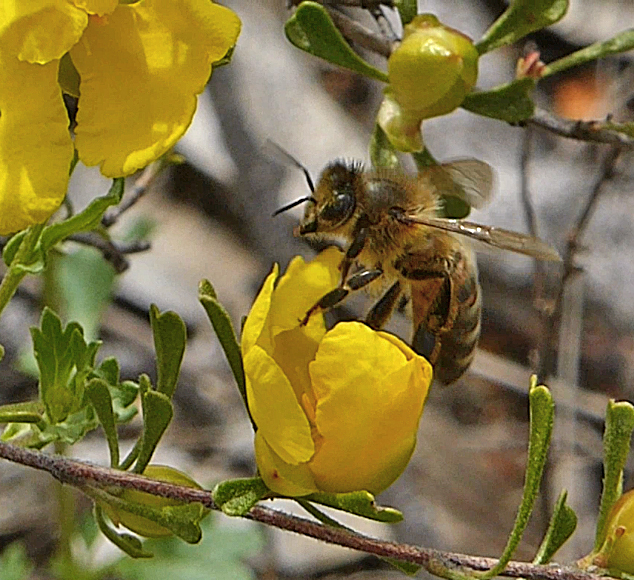 VIDEO: see a 29-second video (3.9 mb) of a honey bee scraping at Hibbertia anthers and getting no pollen. DATES: image 344, 26-Oct-2016, 9.38 am EST; video 345, 26-Oct-2016, 9.41 am EST, Lumix DMC-TZ60; audio 4481, 07-Nov-2016, 7.52 am EST, LS10 with ME66 gun mic. NOTES: This medium-large bee (16 mm in length) has a black and tan striped abdomen. 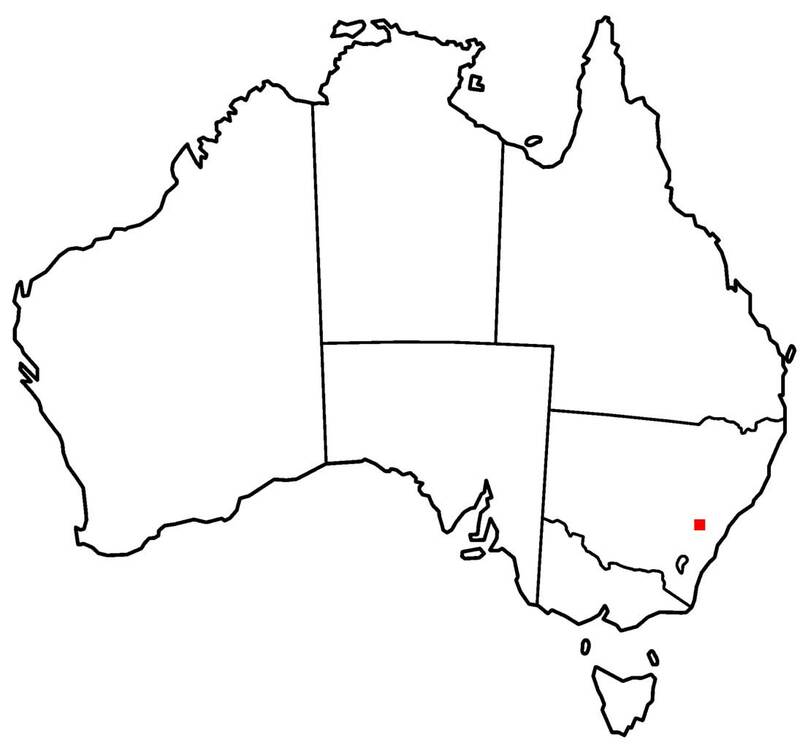 Honey bees were brought to Australia in about 1822 by early settlers. Some populations live in hives but others have gone wild and built their nests in native bushland. 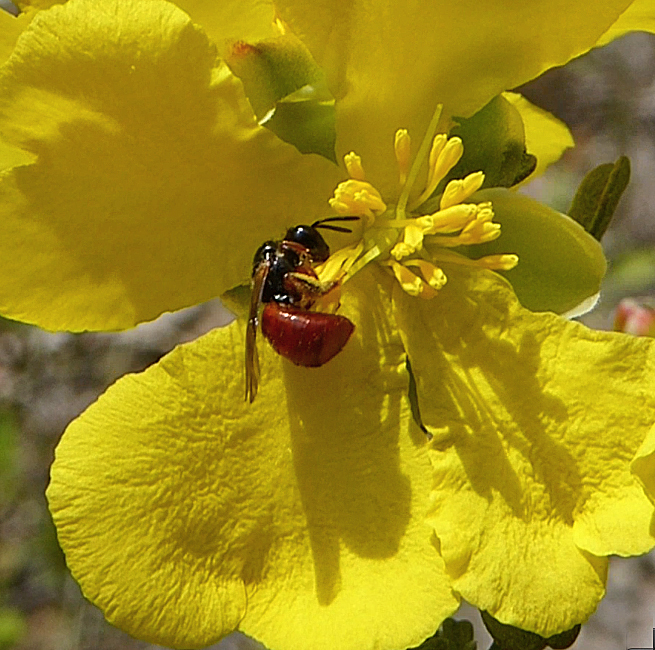 Honey bees cannot buzz-pollinate, so this bee got no pollen from the Hibbertia flower. 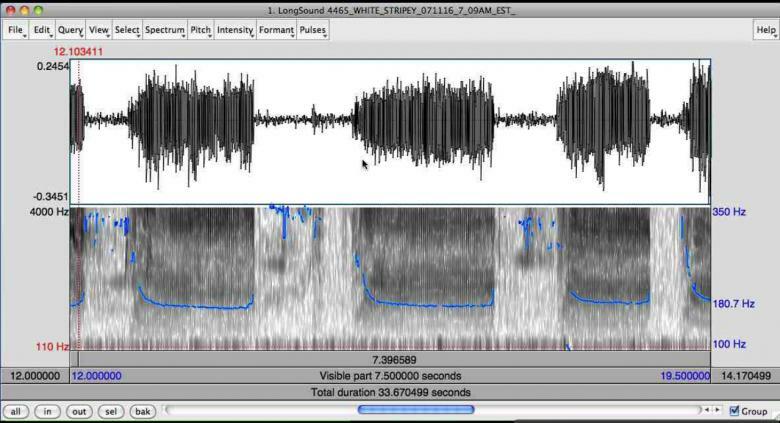 I used Praat linguistics software to measure the fundamental frequencies of the bee buzzes. VIDEO: In this short video (made using iShowU screen capture) I demonstrate how I made the measurements. project! Get in touch via the Contact page.